While jackfruit is a common sight throughout Asia, here in the West, jackfruit is still largely unknown. It is available in many Asian markets and specialty stores. Read on to find out more about this mysterious fruit, including how to prepare it and what to cook with it. Enormous and prickly on the outside, jackfruit looks somewhat like durian (although jackfruit is usually even larger). 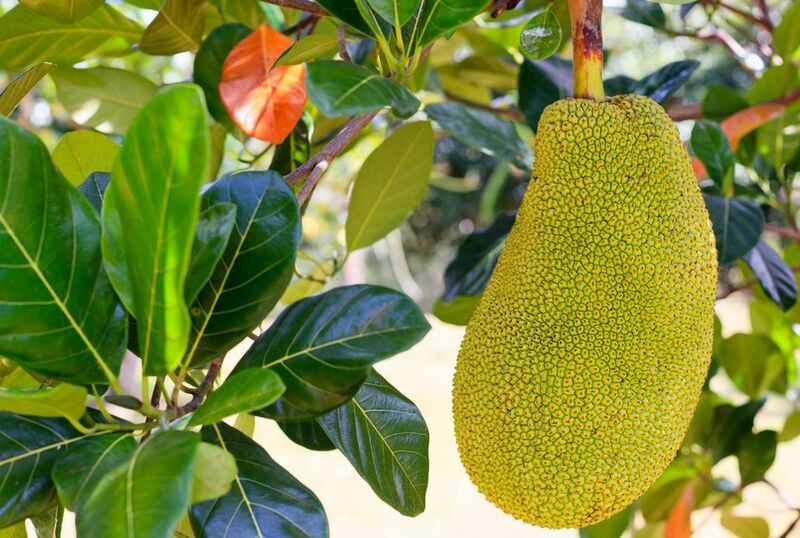 It grows on a jackfruit tree and its fruit is the largest tree-borne fruit on earth. A jackfruit can get as heavy as 120 lbs and over 35 inches long. Jackfruit has a sweet and fruity aroma. Once a jackfruit is cracked open, what you will find inside are pods or "bulbs." Often referred to as the seeds, these bulbs are actually a kind of fleshy covering for the true seeds or pits, which are round and dark like chestnuts. The fleshy part (the "bulb") can be eaten as is or cut up and cooked. When unripe (green), it is remarkably similar in texture to chicken, making jackfruit an excellent vegetarian substitute for meat. In fact, canned jackfruit (in brine) is sometimes referred to as "vegetable meat." Jackfruit can be purchased fresh in specialty markets, frozen, dried, or canned either in brine (usually unripe) or in syrup (ripe and sweet). The fresh jackfruit often comes whole, so prepare to carry home a heavy load. If using fresh jackfruit, it's a good idea to oil your knife and hands first before cutting, as the fruit is very sticky. Use some jackfruit tips which will describe in detail how to cut a jackfruit open to get at the flesh. Jackfruit seeds (nuts) can be roasted like chestnuts, or boiled. If left to cook inside the flesh (for example, in curries or other cooked dishes), the nut softens and can easily be eaten. The fruit is naturally sweet, so can be used in a variety of dishes and prepared in custards, shaved ice, cakes, mixed with rice, or pureed into batters. Jackfruit contains many vitamins and minerals and offers numerous health benefits. The fruit's isoflavones, antioxidants, and phytonutrients mean that jackfruit has cancer-fighting properties. It is also known to help cure ulcers and indigestion. If you're ready to try preparing jackfruit, try it in a vegetarian Thai jackfruit curry recipe. You can also replace any protein in a recipe, especially those calling for chicken, with jackfruit. Recipes like Thai vegetarian green curry (add jackfruit in place of tofu), vegetarian Thai yellow curry (add jackfruit instead of chickpeas) would be a great starting point to cooking with jackfruit. Another option is to add it to Thai salads or Western-type salads, wherever chicken would be used. If you are looking for something more creative, try this recipe for vegetarian pulled pork sandwiches using jackfruit in place of pork. Are Hot Chili Peppers Good or Bad for Your Health? Is Thai Food the Healthiest Cuisine You Can Eat? What Is Pandan and How Do You Cook With It? What Are Glass Noodles and How Can I Cook With Them?